Are you really aware of what kind of restaurants are you entering while you are travelling in Italy? If not, follow us in this nice guide to what has to be expected when you are in Italy and you nwant to dine out. The Ristorante, the Italian word for “restaurant” will welcome you with a full-service eating menu in Italy, with different levels of ristorante and not necessarily the most expensive chance you have to eat out. An Italian ristorante has the most high-end service of any other kind on this list. Trattoria: the difference between a ristorante and a trattoria? Nothing substantial: the trattoria is smaller, on a side-street, and the food establishment is strictly family-run, with the granma or grandpa or the mother or the father actually cooking the menu! “La cucina della nonna” is waiting for you with its good and abundant portion! Osteria is a quite relax estabilishment, no formal at all and cheap! Good wine, good food such as piada or main course can be found in a good osteria with a quite an ancient and rural touch! Taverna is as well as rustic in its design, with inexpensive menu and a strict selection of food: like a night bar for dinner time! Pizzeria are of course the temple of pizza but you can easily find other things on the menu! 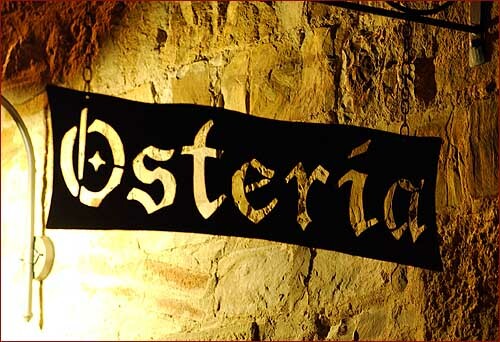 Rosticceria will usually offer you roast chicken or other meats, with a pretty good selection of all kinds of other pre-made meals really tasty like lasagne! Also Tavola Calda offer a counter full of pre-made dishes: you can ask for it by the piece or by weight; then they will be re-heated. The Italian Bar is more like the cafeteria in UK and USA: if you want a quick cup of Italian coffee and a simple thing to eat. Worthy to go and taste an aperitivo! This entry was posted on Sunday, July 22nd, 2012 at 11:32 am	and is filed under Italian Recipes and Food. You can follow any responses to this entry through the RSS 2.0 feed. You can leave a response, or trackback from your own site.